Another game that got away or a performance to be proud of? We had chances to win on Saturday night and a glorious opportunity to put the game to bed in the second half but if you had told me beforehand that we would run Monaghan that close I’d have taken it. After a disappointing league and a stuttering championship campaign, we needed to finish the season with a good performance. And what we got on Saturday was our best performance of the year. We could have few complaints about the result in the end regardless of how you felt about some of David Coldrick’s decisions. Yes Monaghan seemed to get most of the 50-50 decisions but we didn’t do ourselves any favours with our tackling. If you want to take the referee out of the equation, get to the ball first. Otherwise, keep your hands off the man’s back. Too often, we failed on both counts. While I was happy with our overall display, it was incredibly frustrating watching some of the mistakes we made. The golden rule for any defender especially against a team like Monaghan, who have the complete set of free-takers, is to avoid fouling at all costs. Even if a man is clean through on goal, the percentage play is to let him shoot because we have one of the best shot-stoppers in the country between the posts. For any forward, it is always harder to score from play. The warning signs were evident early on. On their first attack, a Monaghan forward was fouled out on the right wing. 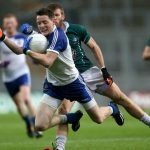 Ordinarily, a free conceded that far outside the 45 is nothing to worry about but Monaghan carry one of the most prolific long-range free-takers in the country. With Rory Beggan on the opposite side, a foul inside the 65 is a precarious act. Luckily for us, Beggan struggled with his shooting in the conditions but I’ve no doubt he would have nailed at least one of his two attempts on a dry night. And whatever about Beggan, Paul Finlay and Conor McManus certainly weren’t going to be so generous. Between them they finished with 0-9. In total, we offered up 12 scoring chances from frees. It’s a sinful amount and something that reflects poorly on players and management alike. The advantage of a double-header at Croke Park is you get the chance to compare and contrast. And if you looked at the quality of Armagh’s tackling in the first game as against the paucity of our efforts then you could only conclude that we sorely miss Kieran McGeeney’s influence in that regard. Armagh have obviously been well-drilled and it was a large part of their success against Meath. Our inability to tackle without fouling was a large part of our downfall. The most unforgivable aspect of that was, what I call, second-man fouls. With Fergal Conway playing deep in front of the full-back line, it meant that we man had extra cover when the ball was played inside to the likes of McManus and Chris McGuinness. The very first free that Monaghan scored from was the result of a foul by Conway when he was the second man on the scene. For all his qualities, and he has been one of our best players all through the championship, Conway has to become more disciplined in his tackling. The sad reality of Saturday’s defeat was that it hinged on free-taking. We didn’t have a left-footed free-taker a la Finlay and our right-footed kickers are still too unreliable for this level. If you did a full audit of our championship matches this year, you’ll see how stark the problem is. It’s getting to the stage where opponents might think it better to foul us because unlike every other team, we seem less likely to score from a free. Take away some of the needless fouls we committed, like Conway’s at the start of the first half, and add the frees that we should have scored from and you end up with a different result. It’s a pity that such a great effort from the team was undermined by such a fundamental failure. We had heroic performances from the likes of Emmet Bolton, Tommy Moolick, Alan Smith and Eoin Doyle and it’s a pity that their efforts were not rewarded with a victory. Bolton’s black card was incredibly harsh when you consider where on the field that foul was committed and the way in which the other games over the weekend were officiated. Bolton was at his brilliant best against Monaghan and his first goal was one of the sweetest moments I’ve enjoyed at Croker in the long time. It was spell-binding and gave us a glimpse of what this team can do at full tilt. His second goal was the result of similar work only the finish was more prosaic. His point was a classy score too but his demeanour is what I love about him. He drives at opponents, takes them on and pushes them back. It is a statement of intent and it sets the tone for both us and the opposition. Moolick, Smith and Doyle did the same whenever they got the chance. Moolick has been the real hero for Kildare this season because he has made the most of himself. That’s all you can ask of any player. That is why he is the future of this Kildare team, along with the likes of Fergal Conway and Paddy Brophy. Whatever they were lacking on Saturday night, you can be sure they will be better next year and the year after. That is why I left Croke Park feeling positive despite the gut-wrenching nature of the defeat. We should have won in normal time. Had Eamonn Callaghan scored what would have been our third goal then there was no way back for Monaghan. And yet it might be a blessing in disguise to avoid Dublin just now. This team is only getting started and it is clearly not ready for that kind of examination. But we are bridging the gap and have made gains since last year. It’s disappointing to be out of the championship but there are bright days ahead. The sad reality of Saturday's defeat was that it hinged on free-taking."